Above: Belgian poster for 42nd Street (Lloyd Bacon, USA, 1933). Artist unknown. 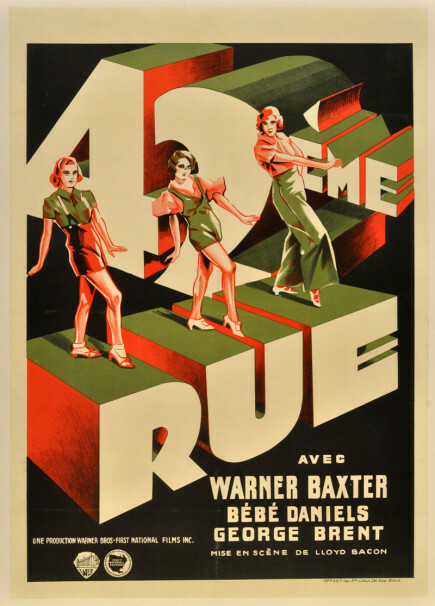 The great Busby Berkeley movie musical, “42nd Street” (1933), will be featured in several fabulous formats during TCM Fest 2015, which opens this Thursday in Hollywood. First the poster will hang, amongst scores of others, from March 26 – 29 at Club TCM in the Hollywood Hotel Roosevelt lobby. Then comes the Festival screening of the movie itself on Saturday, March 28 @ 11:30 am. Broadway Baby Christine Ebersole will introduce the film. Later that afternoon, from 5 – 6 pm, author Mike Kaplan will sign books in the Roosevelt lobby. Yes, books! For Kaplan has conjured a rich special edition of “Gotta Dance!,” a softcover compendium of dance movie posters with text by Kaplan and a fun Foreward written by arts·meme‘s Debra Levine. 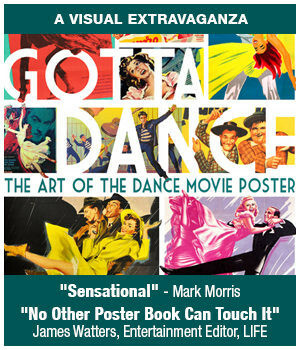 “Gotta Dance: The Art of the Dance Movie Poster” is available via arts·meme by clicking on the icon in the blog’s lower right corner and following through to the purchase point at Lagoon Press. It will also be on sale at TCM Fest courtesy of our good friends at Larry Edmunds Bookshop. The poster exhibit in Club TCM is only accessible to festival pass holders, but the book signing is open to the public.